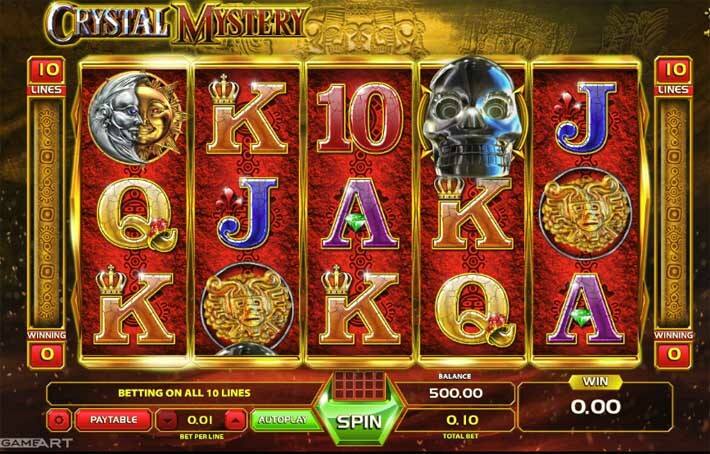 Engage in adventure, mystery and superstition with GameArt’s online slot game Crystal Mystery. There’s a lot of lore and legend involved in this game, so if that’s the kind of thing that makes you tick – buckle up. The high quality graphics and compelling icons certainly make this a thrilling and entertaining gaming experience. Symbols here include ancient Aztec pyramids, gold medallions and a lovely depiction of the sun and moon. Other than that you will also see one of the legendary crystal skulls that is said to be part of an ancient prophecy. As for the backdrop, you can see masks and skulls engraved in the gold wall just above the reels. The layout in this online slot game is pretty traditional, featuring the customary grid of 5 reels and 3 rows. The total number of paylines here is fixed at 10, so you won’t be able to adjust them. We can’t say the same for the betting amounts, though – those are of course at your disposal. The betting range here isn’t very flexible, but will allow for stakes to start as low as 10p per spin. You will be able to bet anywhere between that and the maximum of £5 per spin. And, as this is a GameArt slot after all, the RTP is traditionally at the mark of 94%. 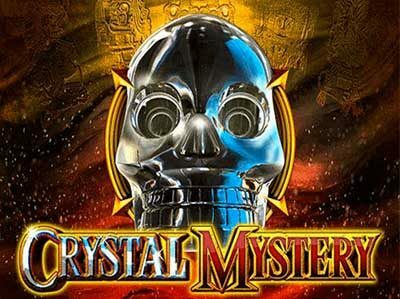 The dazzling crystal skull symbol has a very special role in this slot game. It embodies both the Wild and Scatter symbols in one. As such, you can expect to see it in any position on the reels and it will be able to replace any of the other icons in this game. No exceptions. That way it will be able to help you create more winning combos. In addition, it’s also the second most lucrative symbols, offering payouts of up to 1,000 times your line bet. And what’s more, since it is also the Scatter symbol, it doesn’t need to land on a payline for you to win. But most importantly, the crystal skull Scatter/ Wild will also be able to activate the single bonus feature here. In order to trigger it, you will need to land at least 3 or more Scatter symbols at a time. This will activate the freespins bonus feature, awarding you a total of 10 freespins. In addition, a wheel will randomly select one of the regular symbols to become a Mystery symbol. During the feature, any time a Mystery symbol appears on the reels, it will expand to cover its whole reel. What’s more, you can also retrigger the feature and gain additional freespins. To do so, you will once more need to land at least three or more Scatter symbols anywhere on the screen during the same spin. Crystal Mystery certainly offers a very entertaining theme and does a good job in presenting it thanks to the graphics. But in addition, the freespins bonus feature in the game is also fairly attractive. RESPONSIBLE GAMBLING INFO | GAMBLE AWARE | GAMCARE | 18+ only. Please play responsibly.